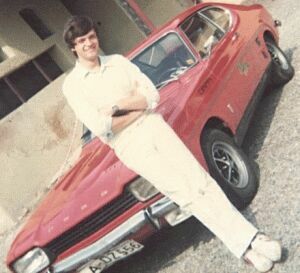 Everything startet in 1980, when I received my driving licence, with a red Ford Capri GT 1600 OHC with 88PS. Actually it began already rather, i.e. 1975 as my father bought and drove this vehicle. And I gladly rode along already at that time. 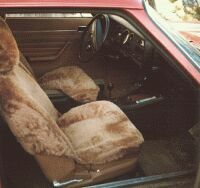 But now were it mine and it were one of these legendary 73-Capris. Probably legendarily, because they drove their owners to the despair. 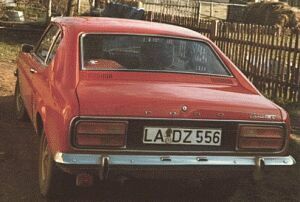 The body actually of the Capri I however with deviations, instrument screen and engine already of the Capri II, headlight, taillights and some different one completely own. The chassis number of this Capris was GAECNU04694. With each spare part I needed those and nevertheless came each second time a wrong part. Nevertheless I had muchh joy until July 1984 as I, or better my Capri, victim one of the worst hail tempests, which had ever afflicted Bavaria. It was carried forward heavy, taillights broken, dents where you saw, but all windows completely. On the next day I already was with the used part dealer and procured myself spare parts. It provided provisional repaired still nearly 3 years its service and had finally over 220000 km on the Tacho. In December 1984 I afforded now one the last 2.8i a Superinjection in nimbus grey and starto silver, as well as front and turbo-tail spoilers. More does not give to say it to it, that the remainder was standard: Sun roof, headlight wascher, differential locking, lockable light alloy wheels, radio with cassette, leather interior equipment with Recaro seats. Nevertheless one got the cheapest car over to drive in the club 200. Those are the cars faster than 200 km/h drive. For the same money one received a naked 90PS AUDI Coupe at that time. A mad car, only I had not much luck thereby, in the first evening with 120 km on the tacho ran me a hare purely, spoilers broken. And in such a way it continued. I had never again as many accidents as with this, my only new car, which I possessed ever. After two years the leasing ran out and I returned it, it was an accident car. Then a no-capri time came. In November 1996I had enough of it, one say not in vain, once Capri always Capri. A 1983 Injection came into the house, or better before it. Spoilers, G-Kat, sport exhaust were fast to. But the joy lasted again not for a long time, the problem was called lead free this time. Despite additives the exhaust valves knocked themselves inexorable into the head. An engine overhaul had ago. But I wanted to drive far Capri. Thus the next bought, a white Superinjection for 1700 DM. When winter capri meant for preserving around the other one and if one takes the rims and the leather interior equipment off, which I wanted anyway always, was the car actually in vain. But new pain drew, the anthracite Capri up in a garage was stored. In this garage it was extremely wet and the Capri dammaged and rusted in the high speed gear. Diagnosis: Total loss. That was in August 2000, the process against the garage owner runs still in the 1. instance. Thus the white had to hold further. Without larger repairs and tire purchase (Fulda, which nearly stay forever) I drove more than 80000 km in 3 years, for 1700 DM not badly. But now also this engine had mentioned problem and also this had into the workshop. 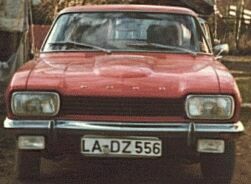 I did not want nevertheless to buy a third Capri now, therefore I drive for the moment a rent granada from my workshop. The white is restored for the moment completely and hopefully in the spring finished, and then it willbe probably blue. 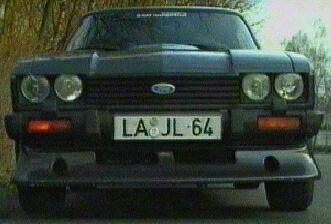 By the way I search the names of the blue color of the 2.8i in the original folder of Fords. The Capri is there blue and startosilver. Also this engine is completely rebuilt and ran already very promisingly in the summer on the test stand. If the Capri with the engine runs a film over the improving measures will give. 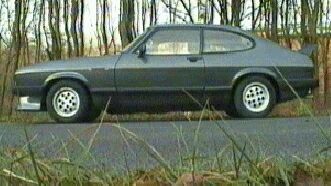 The anthracite Capri was by the way leading actor in my film fascination racing. If there is something new it is accordingly supplemented here.